Monkey Business Creative offers the following workshops for children's educational groups organizations, or individual children. If you would like to discuss our fees, bookings, or any other questions about these services, please contact Michael Anderson by phone at +1 (416) 838-2828, or e-mail us at info@monkeybusinesscreative.com. Introduce your child to a series of music workshops that will explore all facets of music development through active participation. Children will be given the opportunity to explore instruments from around the world, sing songs in different languages and engage in musical drama while building basic concepts and skills in language, math and social interaction. Monkey Business provides music instruction on an ongoing basis or as a one time only performance situation. The Hands on Multi Cultural Music Workshop which the business has been built on, centres on exposing children to instruments from around the world giving them an opportunity to develop a greater understanding of the world around them. Children are given the opportunity to play these instruments and are provided with positive reinforcement to build self esteem, no matter what their level of performance or comprehension. The computer workshop is designed to deliver one on one computer instruction to children of all ages in a class room setting. This workshop will enhance all areas of the child's development and gives the teacher(s) in the room an opportunity to concentrate on other responsibilities while each child receives undivided attention to ensure correct skills and knowledge are attained. State of the art technology/hardware is brought into the classroom, along with relevant and appropriate software titles. This service is offered to school aged children who would like to learn the beginner skills of video production. As a member of Trinity Square Video, Monkey Business has access to professional video equipment. Groups may also hire Monkey Business to film special events which can be edited and either sold as a fundraiser or kept on file for historical purposes. Child care centres may also request video documentation to enhance program development or track a specific child's skills. Click here to see the Michael Anderson directed video for the song "Bananas Unite"
Michael Anderson has been working with children of all ages for 20 years and combines early childhood education principles and professional musicianship to stimulate, educate and entertain children through music. Basic lessons of ethnomusicology will be introduced to promote an understanding of music and culture from around the world. All children will be treated as new musicians with open minds and unlimited creativity and every effort will be made to boost children's self esteem in order to develop a strong and positive self image. 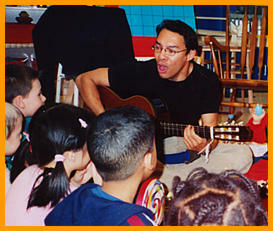 Children's Entertainer/ Recording artist Cosima Grunsky performs children's music for all ages. Cosima is a veteran children's entertainer that started working with her father, Juno Award winning children's entertainer Jack Grunsky, at a very young age.